In the US, pulmonary embolism (PE) kills 100,000 people each year and over 360,000 new cases of PE are diagnosed each year (Horlander 2003). Currently, the gold standard for diagnosing PE is the computed tomographic pulmonary angiography (CTPA). Patients with PE present with varying symptoms, from anxiety and tachycardia, to shortness of breath and syncope. Thus, it is difficult to exclude this life-threatening diagnosis and thus far there is no validated method to exclude PE. 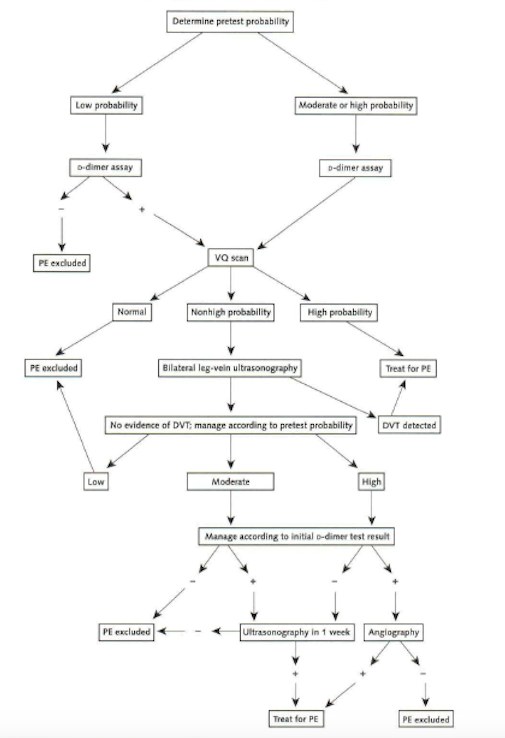 Prior work from this group derived and validated Wells’ criteria for calculating clinical probability of PE, and using it to determine which patients should get serial ultrasonography, venography, or angiography after an equivocal ventilation perfusion (VQ) scan (Wells 1998). Now, this group examines how the D-dimer assay, together with Wells’ clinical model can help manage PE patients. Can the D-dimer assay be used with Wells’ clinical model to safely manage patients in the emergency department (ED) with suspected pulmonary embolism? Adults > 18, who presented to four EDs in Canada with suspicion for PE, due to acute onset of new or worsening shortness of breath or chest pain, with symptoms for less than 30 days. Emergency Medicine doctors determined the clinical probability of PE using Wells’ criteria (Table 1.) as low, moderate, or high pre-test probability. Low = score < 2; Moderate = 2-6; High =>6. All patients also had d-dimer testing. Per the algorithm (Figure 1. ), those patients that had a low pre-test probability and a negative D-dimer, did not undergo any further testing and PE was considered excluded. All other patients underwent a VQ scan. If the VQ scan was non-diagnostic, patients had bilateral lower extremity deep venous ultrasonography. Patients in whom PE was excluded, were followed for three months for venous thromboembolism (VTE) events. Suspected deep venous thromboembolism (DVT) in upper extremity as a likely source of PE, no symptoms of PE in the last 3 days, on anticoagulation for over 24 hours, expected survival less than 3 months, contrast media is contraindicated, pregnant, geographically inaccessible (unable to follow-up). Patient follow up by appointment or by phone call which introduces recall bias. While analysis was per intention-to-treat, 92 patients had fewer tests than indicated, and 7 of the patients diagnosed with PE had more tests than indicated. 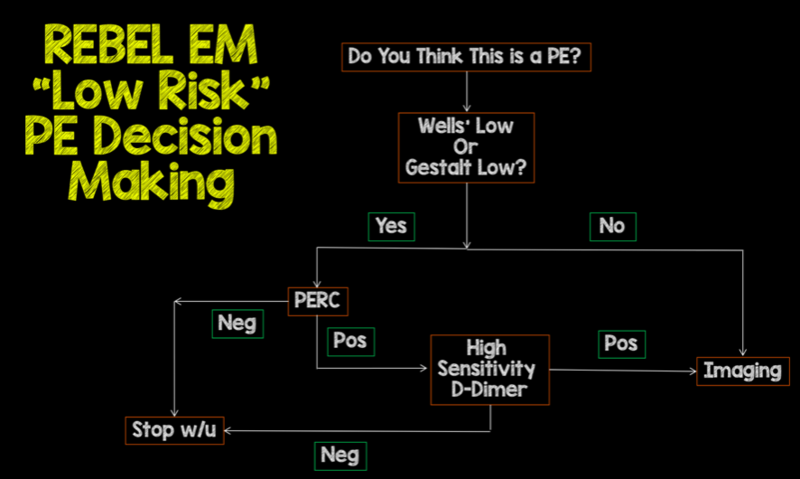 Combined low PE pre-test probability (Wells’ criteria) and negative D-dimer has a very high NPV in excluding PE. Based on these results, patients with suspected PE who have a low pre-test probability per Wells’ criteria and a negative D-dimer can be discharged without further tests/imaging to work-up PE. Wells’ criteria and D-dimer can be used to safely exclude PE in patients with a low pre-test probability and negative D-dimer.